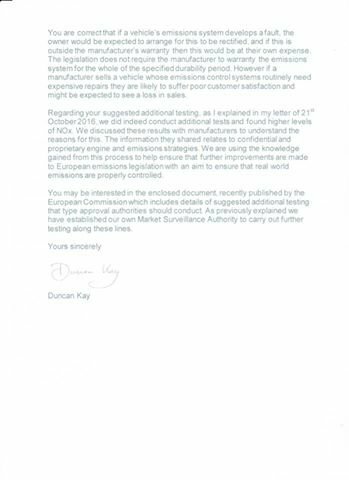 In yet another twist to the dieselgate scandal, the UK’s DfT (Department for Transport) has confirmed in writing that the “fix” offered to VAG owners “causes about twice” the level of carcinogenic diesel particulate matter to be produced. 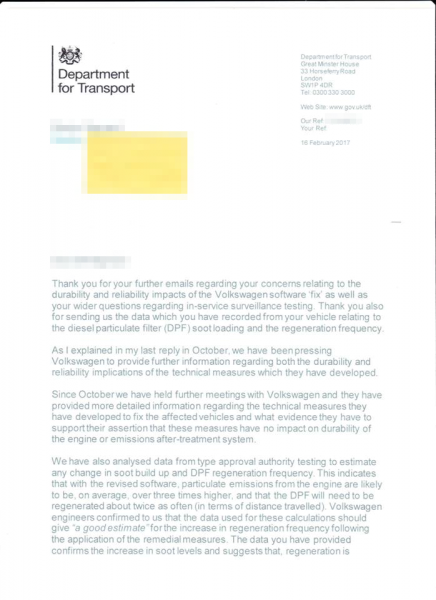 This confirmation was contained in a letter from Duncan Kay (Head of Vehicle Environment Team) to a member of the “Volkswagen diesel customer forum”. 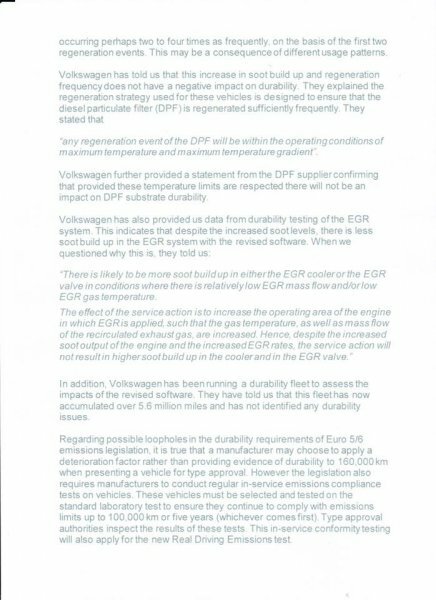 It was in response to concerns raised to the DfT regarding the mass failure of EGR valves and DPF soot loading levels post fix. Like you, we’re absolutely shocked that VW’s “fix” for the emissions issue is to pump “about twice” the amount of cancer causing soot into the exhaust system. 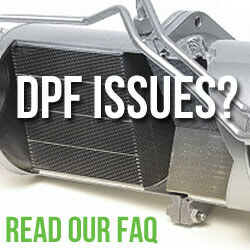 This increased soot level will reduce the overall MPG of “fixed” vehicles (reduced MPG is commonly accepted during a DPF regeneration cycle) and also lead to premature DPF failures due to ash matter build up. The letter confirms our views that the government is washing their hands of customer issues and concentrating on working for with VW. Their dismissal of out of warranty issues despite large numbers of documented EGR failures makes us wonder who the government are siding with. We’re utterly appalled by the actions of VW, dealerships and the DfT. There are whisperings of a planned protest but nothing concrete as yet. We’ll keep you updated as things progress but we can confirm that we fully support such action. We’d also suggest that you get in contact with Duncan with your thoughts on this matter. We’re still trying to locate his email address but you can send a letter to the DfT address at the top of the letter. He’s also on linkedin – a quick google will reveal his account. So, should I have the emissions fix / update? We’re quite clear on this matter, NO. Under no circumstances do we recommend that you have the emissions fix applied. It IS NOT a legal requirement for the fix to be applied and at present failure to do so will not affect the outcome of your MOT. We’ve been reliably informed that VAG dealerships are underhandedly applying the update without owners consent, so please make your wishes clear if your vehicle ever has to visit the dealer or repair or maintenance. Being a diesel Skoda owner myself, I queried this my local Skoda service department and was told that I was within my rights to reject the emissions fix if a “job card” was created for it. We’d also go as far as to say be very mindful of the fix issues if you’ve visited or plan to visit your dealer. 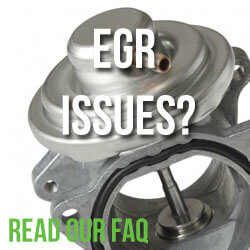 EGR failure shortly after your visit could be a tell tale sign that it was performed without your consent. 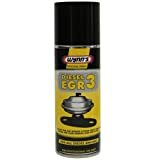 We’re already aware that dealers are ripping off customers with EGR replacements post fix so we wouldn’t put this past them to apply the update without your knowledge. More on that here Dieselgate: Are dishonest dealerships cashing in on VW emissions “fix” EGR failures? What is the The Volkswagen diesel customer forum? This Group is a private forum for VAG customers who are affected by the actions of Volkswagen Audi Group. VAG have engaged immoral behaviour to not only mislead and cheat its customers, but more so it has gone to great lengths to forward its business position by cheating legislators and governments around the world. If you’ve been affected in any way by the #deiselgate scandal or emissions fix then please do let us know in the comments. Dieselgate: Are dishonest dealerships cashing in on VW emissions "fix" EGR failures? ‹ Dieselgate: Are dishonest dealerships cashing in on VW emissions “fix” EGR failures? EGR Failure – VW Would not assist in reducing payment or reduce the cost to me. The EGR valve on my Golf 60 plate was plate in the hottest area of the engine, thus causing it to melt. Emissions issue fix has been refused. I am furious about this, as a customer they have left me high and dry and continue to make it worse by telling me the ecu fix needs to be installed. I flat out refused this when it went in for it’s MOT last month. I have since stopped using that dealership. So if the DFT have such information on the so called VW FIX. then why is it taking so long for them to force VW to reverse the recall on cars to put levels back to what they were. i had the recall done last August and it has caused untold problems. I take it the lawyers know about the government’s view on the #fix# creating problems? I would think they could use this info in court?